Mount Rushmore Didn't Start on a Mountain! Even though I can't identify the source for this quote, it makes sense. Every great artist, specifically SCULPTORS, use miniatures, models, maquettes to plan out their masterpieces! That's a LOT of "M" words!!!!!!!!!! Marvelous! Pat is no exception. 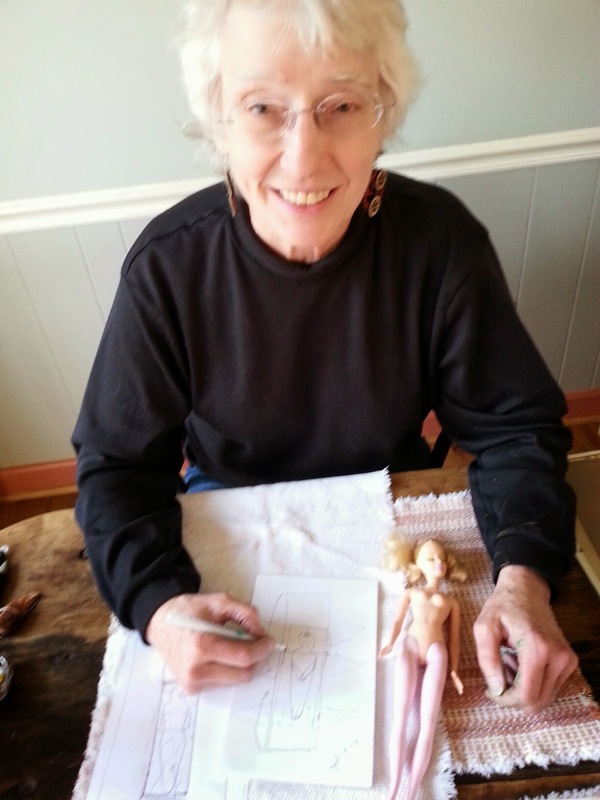 When she began to think about how to create a shroud for me, she used her "Deceased Barbie" to get things going. In arriving at the design, she had many attendant engineering considerations. Wow....the time has gone by so quickly since my last post! Between Death Cafes, National Home Funeral Alliance beeswax (I'm now on their Board of Directors!! ), and our annual Day of the Dead party, it's almost Thanksgiving! Oh. And did I happen to mention a MOVE in there?? Whew!Pat, my artist friend, has been hard at work on my shroud. It is an incredible creation. She actually brought the shroud for me to "slip in to" at the party on November 1st, and much to her dismay...it was TOO SHORT!! Coffee and Cake to Die For! I finally did it! I have decided to host Mebane's FIRST "Death Cafe!" Death Cafes are popping up all over the country, having started in Europe back in 2004. Finally, a taboo topic is gaining ground and people are finding it "normal" to sit around and discuss all aspects of death and dying. Today I actually spent time with Pat for my initial shroud fitting! She has selected wonderful organic materials (muslin for the main body of the shroud and an almost sheer jersey for the face covering). Pat will add a pocket, right on my heart, to hold lavender and rosemary (but mostly lavender because it's my favorite!!) We're imagining that the pocket will be made from tulle with a ribbon of some sort. The title of this post is a quote from Shakespeare's "As You Like It" (Act II, Scene 7) where he defines the seven ages of man. It also served as the title for one of my graduate school research papers at UNC in the year 1981. In the paper, I was making a comparative analysis of Islamic and Christian cemeteries. The year is 1969, and I am a Senior at Hickory High School. Our Honors English class is reading Dante's "Inferno" and I am apparently asking too many questions of the teacher because my friend, Tom, continues sighing. Some exasperating sighs. At one point, he just blurts out: "SARA HILL! YOU ARE OBSESSED WITH DEATH!" This will become one of the defining moments of my life. Thanks, Tom, for speaking your truth. And for the inscription in my yearbook. Forty-five years later, I am STILL obsessed with death. Here is Pat, hard at work with the design of my shroud! Can you see the MODELS she is using, to help explain to me how the shroud will work?!! She found her Barbie at a thrift store and told me, "It was obvious from her purple lips, discolored legs, vacant stare, and general stiffness that she had departed this life, so I closed her eyes out of simple decency. Mabel's demise was sudden and unexpected, but fortunate for me, as I needed a more zaftig model!!" Well, it might look odd to see "The End" at the beginning, but with this new blog, I will be telling the tale of how my funeral shroud is being created. I will also write about how I came to be interested in death and dying, a topic that my generation, "the baby boomers," is beginning to talk about more openly. I am blessed to know a wonderful artist in my hometown of Mebane, North Carolina, and she graciously consented to design and make my funeral shroud.